Laser surgery is just a five-minute operation, but before the surgery your eyes need to undergo precise and extensive exams. The technological developments of vision adjustment in recent years have greatly increased the accuracy and safety of laser operations of the eye and have noticeably improved results. An FDA study in over 360 patients with myopia that ended in 2006 found that 92.5% of patients saw 1.0 or better and 99.5% of patients 0.5 or better without glasses after laser surgery performed with a MEL 80 laser. At our disposal are the newest Zeiss eye lasers in Estonia; thanks to the best set of diagnostic instruments, risk is reduced to a minimum and the surgery is as exact as it can be. Several of the instruments, such as the wavefront analyser, corneal coherent tomograph and the digital laser that follows the eye axes during surgery, are unique in Estonia. The most important prerequisite for a good result is for the laser beam to go exactly where planned on the cornea during the operation. 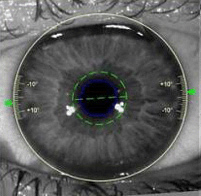 The correct position of the laser beam and the eye during the procedure are controlled by a fast laser tracking device (eye-tracker) that has a 6-millisecond reaction speed. The axis of the eye is a turned-in standing position compared with a supine position. We are the only clinic in Estonia to use axis change adjustment with the 2006 Carl Zeiss OcuLign technology. The image of the blood vessels in the eye and the iris pattern are used by the digital technology to record the eye axis. This ensures that the laser beam will come exactly into the planned area when the patient is lying down. Comparative studies have shown that the digital registration of the eye axes (iris registration) allows astigmatism to be corrected 25% more accurately with a laser. ReFocus is the only eye clinic in Estonia to use wavefront technology-based eye axis digital registration. Light beams pass through the cornea of the eye, are refracted and converge to the eye fundus. The radius of the curvature of the surface of the eye is different between eyes. Depending on the radius of curvature the light beams that pass the central cornea undergo either a little more or less refraction than beams that pass through the peripheral cornea. The resulting optical inaccuracy, where peripheral beams are out of focus, is called spherical aberration, which is one of the many higher stage aberrations. In some eyes the corneal spherical aberration can also be optically helpful, so it should not be adjusted. The MEL 80 addition to the wavefront is the only laser system which allows for an adjustment of various higher stage aberrations on an individual basis. Metaphorically speaking, this means that with wavefront optimized laser treatment all eyes receive a more-or-less suitable medium size and shape hat, but individualised wavefront treatment places an exactly dimensionally suitable hat on the eye. Individualised wavefront treatment gives better contrast vision than wavefront optimised treatment.